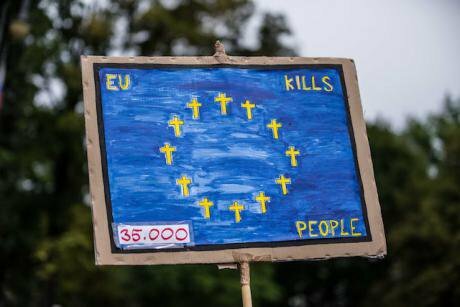 European democracies and the responsibility to not protect? How can we understand the paradox whereby migrant deaths and increased resources develop concomitantly? August 25, 2018 Sea Rescue is NOT Negotiable say over 1000 who took to the streets of Munich to demand a stop to the criminalization of sea rescues in the Mediterranean Sea. Sachelle Babbar/Press Association. All rights reserved. Although the number of migrants and refugees arriving in the European Union has decreased this year to numbers comparable to pre-2014, the probability of dying for migrants crossing the Mediterranean has increased. The International Organisation for Migration reports that more migrants are dying every year in their attempts to reach Europe: from 4 in 1000 in 2015 to 14 in 1000 in 2016 to 24 in 1000 in 2018. This phenomenon seems even more surprising considering the growth of funds that European states and the Commission have accorded to migration management. Indeed, Frontex, the European border management agency, whose mission includes “saving lives at sea”, has seen its budget move from six million euros in 2005 to 320 million today. How can we understand such a paradox whereby migrant deaths and increased resources develop concomitantly? A closer look at the framing of migrant deaths in the Mediterranean may provide some answers. Within this framing we can identify three dominant and interrelated problematisations of migrant deaths which allow European states to relativise or even deny their responsibility for these “casualties”. The first frame presents itself as the unavoidable result of a legal rationality. Time and time again political leaders and international organisations alike argue that these deaths are the result of the criminal activities of smugglers who make profit out of human misery. Smugglers overcrowd makeshift boats and send migrants off on hazardous journeys towards European shores. The problem of migrant deaths is then due to this illegal, exploitative activity. According to this narrative, if we want to reduce migrant deaths we must eradicate smuggling. This view is widely contested by academics and civil society actors as ignoring the structural conditions that encourage smuggling – that is to say the hardening border policies and the reduction of legal pathways, which render migrants increasingly dependent on smugglers if they wish to seek asylum in Europe. Accessing asylum structures in a European state almost always involves embarking on dangerous journeys and “breaking the law”. The legal mindset conforms to the belief that these fatalities are rooted in disorder and illegality. The phenomenon of migrant deaths in the Mediterranean, they say, could be resolved through the respect of law and order. The second framing – bureaucratic rationality – removes the responsibility of European states from migration deaths through the delegation of competences. Since the 2000s, European states have been outsourcing migration management to private actors and non-European states, such as through the conclusion of agreements with states like Turkey and Morocco with poor human rights records. This process known as externalisation is justified by arguments for efficiency and humanitarianism. Indeed, it is held that it is risky for migrants to cross the Mediterranean, their wellbeing would be better served at “home” or in neighbouring countries. This delegation of competences also takes place inside the European Union notably through the Dublin regulation (1997, 2003, 2013). This regulation obliges asylum seekers to register in the first European country they enter. This renders only a small number of EU countries responsible for the vast majority of asylum claims, notably Italy and Greece. In reality, this policy shifts responsibility to peripheral countries forming a cordon sanitaire. The large majority of European states can now justify their non-intervention by referring to legal rules like Dublin. The pretended rational division of competencies and responsibilities conceals from view the way in which European leaders have designed their own irresponsibility. The third framing – rationality of efficiency – is underpinned by the argument of a lack of resources. Some refer to the lack of jobs, others to the lack of appropriate reception structures. In 2015 Slovakian authorities even claimed that they were unable to receive Muslim migrants due to a lack of mosques. In Germany recently, an editorial in the center-left Süddeutsche Zeitung, evoked the humanitarian necessity to stop migrant flows from the Mediterranean in order to prevent their social degradation from middle class to a European underclass. As the argument goes, European countries only have a limited migration carrying capacity and cannot afford to host migrants with human decency. They refer to an imaginary tipping point in which European societies pass from social cohesion to economic, social, cultural and political chaos. Are migrant deaths at the border preferable to such chaos? While this thinking does not refer to legal rules per se, it refers to the law of homo economicus, that is an individual whose behavior is driven by a desire for profit maximisation. These three framings reflect a unidimensional understanding of law as if law is not a matter of interpretation and can be unproblematically applied to any given situation. They share a total reliance on a system of rules and laws which purport to be neutral and deny a role for political agency. The German chancellor’s decision in 2015 to temporarily open the borders to migrants was criticized for not respecting the rules of European migration management. Today’s “rulification” of migration policy would make such a decision ever more unlikely. Problematising migrant deaths as collateral casualties caused by the necessary application of rules and laws enables European states to frame their role in this tragedy as a passive one. Has the perpetual reference of European states to laws enabled the creation of a responsibility to not protect?